HH Corporate Wellness is a division of Huntsville Hospital, the largest hospital system in North Alabama. As with most corporate entities, this group has to balance relating to the main hospital while promoting the unique offerings they provide. The website mirrored those unique challenges of needing to pay tribute to the parent entity and providing different content to consumers and corporations. Usually a site can narrow its audience to either consumer or business – this one needed to appeal to both. The client was very keen on being seen as a resource for their audience, so going with a WordPress structure fit their work style very well. They are able to upload recipes, healthy lifestyle articles and event schedules very easily. 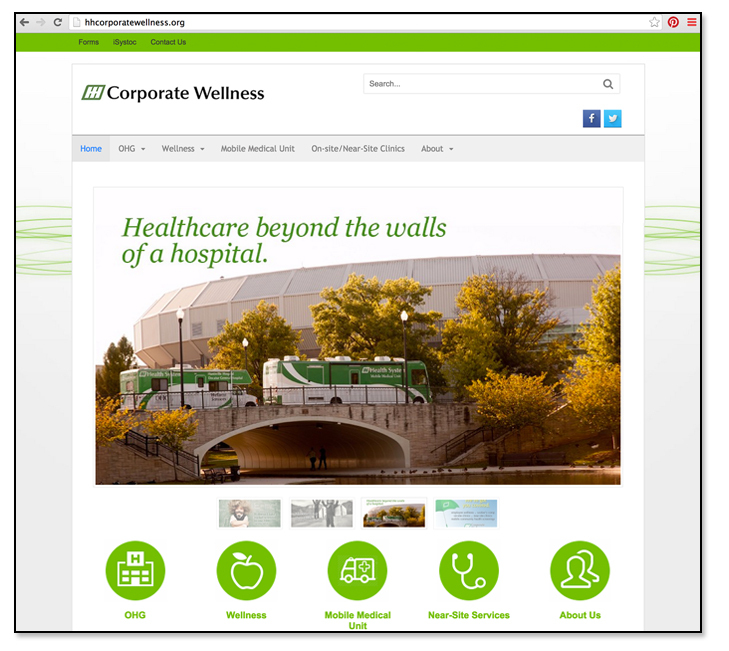 JB Communications Group was able to provide HH Corporate Wellness with assistance in organizing content into a user-friendly navigation system. The design was based on existing Huntsville Hospital elements to help tie in to the larger corporate structure. The client also benefited from JB Communications Group’s quick responses to their edit requests and build outs, something which is often hard to get from a corporation’s IT or Marketing group who have many other departments vying for their services. JBCG was also able to work quickly with the changes to this group’s reorganization and renaming, which happened during this website build.